Andrew Svaldenis - a rising Movie Star ! 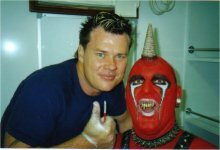 The "Red Devil" in makeup. The basketball player Andrew (Audrius) Svaldenis was born in 1965 in Lithuania and settled with his family in 1980 in Australia. Being 205cm tall he played basketball for 15 years with NBL in Australia. Serious injuries caused him to leave his beloved sport and he found it hard to bear, the sad news that he will not be able to continue playing. In spite of a heavy work load in his business, heavy burdens and painful disappointments, he was attracted to the "Fox Studios" evening classes, where he studied drama for two years. Having completed these studies in 2001, he was invited to further his studies in New York at no cost to him. Unfortunately, due to his business commitments, he has had to defer these studies to the future. 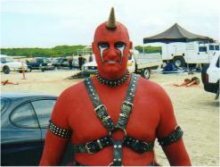 The "Red Devil" on location. In addition to his work, these days he coaches juniors at a school in the Sydney suburb of Kirribilli. Andrew is happy to be able to help and share his experience with the young. In March, 2003, having received a recommendation from "Fox Studios", Andrew Svaldenis was invited to act in a Japanese film, a fairy tale about good and evil. He had the role of the "Red Devil". The filming took two weeks on a beach in Sydney. With Andrews' agreement, the "Red Devil" posters in which he features will be displayed in Japanese movie houses. The name of the movie is still confidential, but the film's release date will be before the end of this year.